Tonight the girls had their first Little Flowers meeting! They were thrilled! A friend of mine tried to start a group last year, but found out she was pregnant (with our adorable new goddaughter) shortly after, so we only had one meeting. The girls asked all year when the next meeting would be, so I decided to organize and lead it myself this year, with the help of the other moms. Tonight we had 8 sweet little girls and their mom's, and we had such a great time, even though I was totally nervous, since I have never led anything like this before! It actually wasn't the girls that made me nervous, it was all the moms!!! ;-) I don't know why, they were encouraging me along the whole time... it's just my personality. We will be working our way through Wreath One. Each month the girls will learn about a different virtue and how to practice it so it becomes a habit. There is also a saint and flower for each month as well. 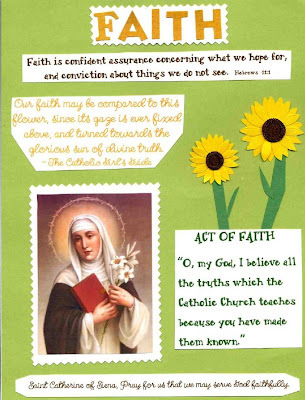 Tonight was based on the virtue of Faith, Saint Catherine of Siena, and the Sunflower. We then moved on to coloring a beautiful coloring page of St. Catherine of Siena, thanks to a very talented friend. Twinkle Toes' and Chiquita's are on the bottom right corner! Chiquita was really loving the brown! We then moved on to the craft. I had purchased the Craft Companion, but wasn't too crazy about any of the suggestions... Instead I decided to have the girls create notebooks. 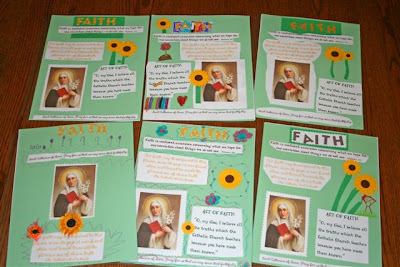 Each month we will add a page to the notebook based on the virtue of the month, with a picture of the saint, flower embellishments, and quotes (or possibly copywork for the older girls). I loved seeing how all the girls put their pages together. I love how she added a little drawing of herself! The other night I picked up some darling pink binders with the clear pocket on the cover, so we will be decorating those and placing each of the pages into the binder. One of the moms said that she has quite the scrapbooking stash and offered to help out with this! She even said she probably has some rose stamps that would be fun to use as well! Next it was snack time. I will be assigning each mom a month to provide snacks, and one of the moms made the cutest sunflower cupcakes for the girls! The meeting ran late, and we may need to start it earlier in the future, but overall we had a wonderful night, and one my friends even came over to visit afterwards!!! It is always nice to have visitors, but even more so with hubby gone! Thank you Amy for staying and chatting, it was fun!! Saint Catherine of Siena, Pray for us that we may serve God faithfully. I LOVE your notebook idea! They will be so beautiful. Will they also have pages where they can write down what they did to work on the virtue? I did LF with my oldest (10-12 years ago!!!!) when there were no books and no sashes. We used aprons and cross-stitched their names on them. I think the flower patches were just barely getting started then. Our TORCH group used it last year a little bit, so we have the book, and I was thinking about starting a group, but now I'm doing AHG. Look for a blog post soon; I can feel one building! lol. Does 'Matilda' only have those few coloring pages on her site? I didn't see one for St. Catherine. It all looks so beautiful! The notebook is a fabulous idea. I was always disappointed with the recommended craft ideas and tried to find my own. Those cupcakes were really perfect! I made the St. Catherine for Jessica yesterday to help her out of her predicament. I will post it to my blog today for everyone to use. The rest can be found in my sidebar. Jesica~EVERYTHING was perfect!!! It was a very fun evening, even for the moms. The best part for me... Punky ACTUALLY played with the other girls,(no "flapping") and she already wants to know what we are doing at the next "party." Thank you and thank you Matilda!!! The drawing is beautiful and perfect. Wow!! You did such a great job!! All turned out wonderful. Wish we lived closer that's for sure! I love Mathilda's pictures, they are great! That copyright thing is really too bad. On a sidenote, it always makes me smile to see a little girl's baptism announcement in the bulletin who was named for our patroness. There are many, many little girls running around in our parish with the first or middle name Teresa, Therese, etc. There is a wonderful devotion to her here and she continues to bless our school and parish, spending her Heaven doing good on Earth, sending down showers of roses that we might become closer to God. Excellent first meeting! What do you mean you were nervous, you did a marvelous job Jessica! Things truly have come a long way since one of our daughters was the first Little Flower when our group formed in B.C., from Rachel's leading actually when the very rough sketched typed/copied pages (got them at the very first Seattle conference too, great huh?) were offered for others to try out. There were no color pages for us either (nothing actually at all to use for ideas), so a local talented teen gal made all of ours and taught the girls drawing at the same time, eventually drawing their own copies freehand. Moving here was so disappointing because another younger daughter was left out when we couldn't find other girls to form a group, thus we entered a new path after pouring out our hearts and souls with the two older daughters in Little Flowers. I felt awful so we find it fun to supplement the lessons into our days just her and I. In our group, all of the mothers remained so pumped in the early beginnings (we went for four years with that round of gals, ages 8-12), having and using so many ideas that we eventually thought it would be fun to share them with the organizers. You'll see my name in the front of the book inside maybe because I think we drove them crazy when we kept thanking Rachel over and over again (kidding. Very fun! Anyway, long story short here, you are entering a whole new realm and no matter if you are "seasoned" at something like this or not, one tip that comes to mind is to please afford yourself the assistance of all the other mothers. We always insisted on taking equal turns teaching (we brainstormed together first), and it offered more motherly examples to the girls in more ways than one. I cannot tell you how great and wonderful all those years have been for me, and all the ladies who have formed solid friendships over the experiences. You will be absolutely be blessed! The copyright thing really is too bad because "sharing" is right where it's at...(we shared alot and some of us can't help but wonder about how many items are published today which we did way before, like the sash we began, making badges, high tea lessons, music, art, saints and prayers to match the flowers, activities etc....guess it happens that copyrights get in the way huh?) BUT, hip hooray and hats off to Charlotte coming to your rescue! What a wonderful and generous woman! Oh I'm so happy to see your post. You did a great job! I bought the start up kit and got it approved by our parish priest but then we moved. I tried to start it up here in WA last fall but it never really took off. I guess it wasn't meant to be. But I still have all this great stuff and I don't know what to do with it. Good luck with your sweet, little group. They, and you, will love it! How wonderful that you are doing this for your group, they are so lucky to have you! It looks like it all turned out great -- I love the notebook idea and the cupcakes were perfect! The meeting was great Jessica! Everyone had an incredible time and I loved visiting with you too! Any time! i am so sad we will be missing this. it looks like fun!! Great ideas! I bet you did a super-duper job. Sure looks that way. Sweet girls eating sweet cupcakes! The pictures are lovely but your daughter's eyes...oh! They are just gow-ah-jus! I know Laura! Aren't they!? Every time I see her I think how fabulous her eyes are !! Sara ~ YES!! The girls will be able to add all sorts of various pages to go along with the virtue on their own. This month I typed out the assignments for them, and they will be able to add some copywork and research to their binders as well. How much they do will depend on their age and ability (as well as how much their moms work with them at home). Aubrey ~ Yes, it IS a program and you SHOULD look into it!!! Other than their ridiculously strict copyright laws, it is an AWESOME program!! Your girls would LOVE it! Wow! What a fabulous start to your LF group. I love the notebook pages (what a great idea!) and the cupcakes - I'm partial to sunflowers so they are especially appealing. You've made me wonder whether I could run something like this. What age is the Little Flowers for? and what is a good minimal number for a group do you think? Oh Erin, you TOTALLY could!! As far as size, I was totally willing to start a group with just 4 girls... My two and two others that were interested, but as soon as the word got out I found myself with 10+! Personally, I don't really want our group to get any bigger. I think 8-10 is a great number. Anymore would overwhelm me, I think. How wonderful! My friends and I are getting ready to start up a group in our town. Your post will certainly be a great help! Hi my name is Regina and I'd like some advice. I really, really would like to bring a little flowers group to our Catholic school. I have already found a co-leader. We were thinking of getting it going next fall or would this spring be better. If we started next fall Sept. how many months should it run for wreath I? Offering the group K-2, do you think weekly or bi-weekly and the duration of the meeting? Please continue to post your meetings! It is such a great help to those of us just starting and feeling a bit in the dark! LOVE the scrapbook page! Hello Regina ~ I am so sorry it has taken me so long to respond. We lost our baby a couple days before you left your question, and I am still trying to catch up. Wreath one is broken into 9 virtues. I am sure there are many ways you could set up your meetings... Our group has one meeting per month and we will end with a Tea Party in the Summer (meeting #10). Our group is pretty much k-2 as well, and our meeting is about 1 1/2 to 2 hours long. I do wish that we could have bi-weekly meetings, but with everything else I have going on it just isn't possible. There is a yahoo group for Little Flower leaders that I highly recommend checking out. I have learned a lot from other leaders myself, and it is an awesome place for more advice! Good luck! A friend and I have just decided to become co-leaders. I was excited but now that I've seen your photos I'm extatic! Thanks for sharing. God is working miricles here! I just started a Little Flowers group and will be coming here for ideas! Thanks! This is a beautiful site! I am looking to start a group of my own this fall (I have never done anything like it before!) and I will be checking back here often for ideas! Thank you for your beautiful example! Jessica- I am getting ready to start a Little Flowers club and have been searching your sight for ideas. I think I will adopt your notebooking idea. Can you tell me where I can find the letter punches that you used for those pages? I'm not very crafty but I will do my best! Thanks for the great ideas! Jessica, I am getting ready to start a Little Flowers Club and have been searching your sight for ideas. I think I will adopt your notebooking pages...wonderful idea! Can you tell me where I can find the letter punches that used for those pages?? I'm not very crafty, but I will do my best! Thank you!! For our first year I purchased a package of the letter punches from Wal Mart. I haven't seen them since, but if you have access to a cricut (or other personal cutter) you could make them yourself. After the first year I started including the actual virtue name on each of my scrapbook pages, so that we didn't need to find or make the letters. I hope that helps! I am a homeschooling mom from Springfield, IL and I am starting a Little Flowers Girls' Club in our homeschooling group. I would love to use your notebooking pages. I am having trouble opening the FAITH page on Scribd. It is telling me that it does not exist. Is there any way you could help me? You do such a GREAT job sharing your gifts and talents on your blog! I LOVE it!!!!! Thanks and God Bless!